Ranbir Kapoor on a secret vacation with lady-love Katrina Kaif in New York? Ranbir Kapoor is reportedly on another 'secret' vacation with his lady love Katrina Kaif. Bollywood actor Ranbir Kapoor is reportedly on another ‘secret’ vacation with his lady love Katrina Kaif in New York. Post the release of his latest film ‘Besharam’ the actor wanted a break and so here it was. Besides Katrina,Ranbir is reportedly accompanied by his close buddy and ‘Yeh Jawaani Hai Deewani’ director Ayan Mukherjee. Ranbir Kapoor might have chosen to keep this NYC vacation a secret,however his fan posted a picture revealing his visit there. The trio had been for a vacation to Ibiza,Spain in August earlier this year,where the photographs of showing Ranbir Kapoor holidaying with bikini-clad Katrina Kaif went viral. Ranbir Kapoor has confessed that Katrina Kaif holds a special place in his life but he does not want to end the mystery by talking about it in media. 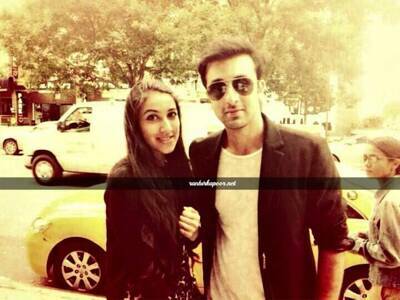 Ranbir Kapoor was recently in New York with his parents Rishi and Neetu for the promotions of ‘Besharam’. The actor also participated in the Diwali extravaganza ”Diwali at Times Square’. There are other rumours doing the rounds that Ranbir is also planning to buy an apartment in the Big Apple. 1 Uday Chopra says he is dating,is it Nargis Fakhri?